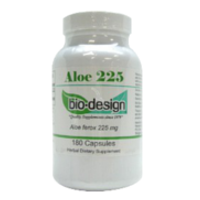 All of the Bio-Design Aloe formulas contain Aloe ferox, a species of aloe that provides a natural laxative effect when taken internally. Most individuals can expect gentle relief from constipation within 24 hours. People will require different quantities and strengths of aloe, depending on their individual needs. Occasionally, some intestinal cramping may occur when first taking aloe, but this will usually pass within 1-2 days. It is normal to reduce your quantity of aloe over time, so be sure to consult with your physician if the laxative effect becomes too intense.